Distinguishable isolated LSW formations can be identified in the time series of vertical profiles (Fig. 24.5), in the volumetric density census (o2, Fig. 24.6a), in the volumetric potential temperature-salinity censuses (0-S, Figs. 24.6b and 24.6c), and in the compilation of annual 0-S curves (Fig. 24.9) constructed from corresponding annual volumetric 0-S projection. 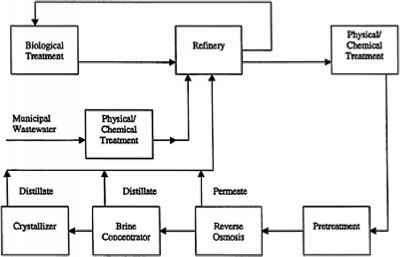 These methods applied to each basin-survey reveal the principal water masses residing in the studied basins. The o2 and 0-S volumetric approaches are the most appropriate for identification of a convectively formed water mass. A volumetric peak with its 0-S-o2 coordinates, area and also integrated and mean heights identifies a specific LSW formation, with the peak's maximum or its central point representing the "core" of the examined water mass. All annual volumetric peaks like the examples shown in Fig. 24.6 form continuous progressions reflecting year-to-year development and transformation of a specific LSW core. This grouping allowed us to introduce a LSW "class" representing a sequence of LSW cores with a common development history. Analysis of all annual hydrographic surveys of the subpolar North Atlantic allow us to build a complete history of formation, development, spatial and temporal evolutions, and decay of two LSW classes, LSW1987-1994 and LSW2000, characteristic for the last 2 decades (Figs. 24.5-24.9). These two classes were identified by their progressively "evolving" volumetric peaks (e.g., the ridges of high values in Fig. 24.6a or local maxima in Figs. 24.6b,c); the subscript names that were given to them reflect a time period (1987-1994) or a particularly extraordinary year (2000) during which they progressively developed to their extreme cold, dense and voluminous states. The first LSW class, LSW1987-1994, is associated with the most extraordinary production of LSW ever reported. A solitary volumetric 8-S peak (maximum) was first observed in 1987 at o2 = 36.885 kg m-3, and reached its all-time high in 1994 at o2 = 36.940 kg m-3 (Figs. 24.6a, 24.7 and 24.8), completing this unprecedented phase of LSW production. Having reached its record volume in 1994, this LSW class (the LSW1987-1994 peak) has substantially diminished over the subsequent years, becoming barely identifiable in the volumetric diagrams constructed for the early-to-mid-2000s (Fig. 24.6a and the year 2004 in Fig. 24.6b). On the other hand, the remnants of the transformed LSW1987-1994 still show a characteristic salinity minimum, helping with objective identification of this LSW class. A thick weakly stratified layer (high Ao2 layer thickness, weak density gradients and low vertical stability) reappears in the Labrador Sea in 2000 as the second LSW class, LSW2000 (Figs. 24.5, 24.6a and 24.8). It was massively formed in 2000 and continued to develop and deepen over the subsequent years. It is found at shallower depths and lower densities than the LSW1987-1994 class. The two LSW classes defined here have much in common. Both of their developments were preceded by freshening of the upper layer (Fig. 24.5), followed by years of increased wintertime atmospheric forcing (Fig. 24.4). Both waters are surrounded by saltier and often warmer layers (Figs. 24.5 and 24.8) and water columns, and both became warmer and saltier over the years following their massive convective formation (Figs. 24.5, 24.7-24.9). When a certain LSW class loses its volumetric prominence (e.g., LSW1987-1994 in recent years), additional criteria can be used to validate and refine its volumetric definitions (e.g., salinity minimum). LSW series (Fig. 24.7) provide a convenient source reference for this water mass that can be used to interpret the LSW signals observed in other Atlantic basins, as well as changes in other water masses (see Chapter 21). A final tool for analysis is the construction and compilation of 8-S curves to represent yearly typical hydrographic conditions in the Labrador, Irminger and Iceland basins over the last 2 decades (Fig. 24.9). Two separate sets (panels) of 8-S curves are shown for each of these basins. The 8-S curves were grouped to allow us to illustrate the two principal phases in a full-record long history of the LSW1987-1994 class. The left columns in Fig. 24.9 represent the progressive development phase of LSW1987-1994 and the right columns represent the subsequent transformation phase, characterized by rapidly declining, decaying and ultimately vanishing of this LSW class. The procedure that we used for building an individual basin-survey 8-S is given in Yashayaev (2007b), and is briefly described here. First, all available measurements within a 50-150 km range of the AR7 line were used to construct annual volumetric 8-S censuses (0.1 °C x 0.01 8-S intervals) for each basin. Then, taking these censuses one by one, all 8-S points from individual o2 ranges (Ao2 = 0.010 kg m-3) were averaged with the weights based on the corresponding 8-S layer thicknesses. In addition to documenting the progressive development (1987-1994) and the subsequent decay (1994-2005) of the LSW1987-1994 class and the recent development of the LSW2000 class, Fig. 24.9 effectively demonstrates the temporal and basin-to-basin transformations and changes in the Northeast Atlantic Deep Water (NEADW) and Denmark Strait Overflow Water (DSOW) associated with large-scale mixing and signal transfer in these waters (see Chapter 21). In this section we will describe in detail the two LSW classes, discuss the stages of their development and transformation within the formation region, and examine the signatures of these stages in the other subpolar basins. A strong freshwater anomaly had developed in the upper 500 m of the Labrador Sea over the late 1980s (Figs. 24.5 and 24.8). The excessive amount of freshwater initially stored in the upper layer was redistributed over a broader depth range in the subsequent years. This vertical redistribution of freshwater in the water column of the Labrador Sea was caused by the recurring strong winter convection events of the years 1987-1994 that collectively produced a large homogeneous volume of exceptionally cold, fresh and dense LSW reaching below 2,400 m (Figs. 24.2, 24.3 and 24.5-24.9). This water formed a distinct LSW1987-1994 class. Between 1987 and 1994, this water mass became about 0.45 °C colder, 0.06 kg m-3 denser and almost doubled its volume. 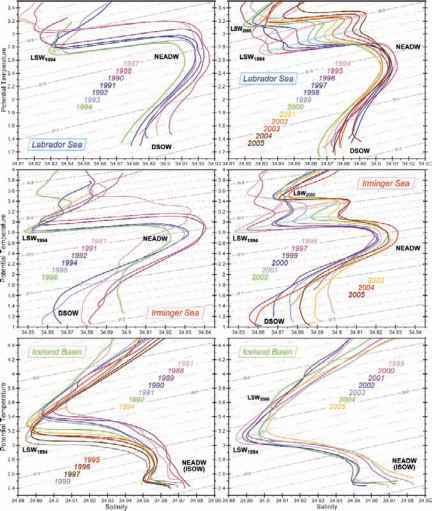 Although mid-depth layers were becoming fresher, when viewed as a series of properties in the deepening volumetric core of LSW1987-1994 it can be seen that as convection was getting deeper between 1990 and 1993, the LSW1987-1994 class was steadily becoming saltier. This salinity increase is best illustrated in the 8-S plot in Fig. 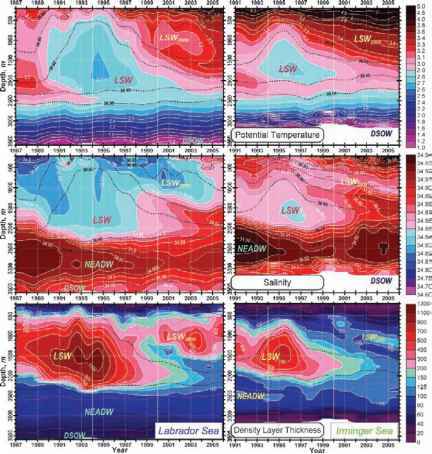 24.9 (see the light-colored arrow-headed line behind the 1987-1994 8-S curves in upper left panel), where in 1993 the well-mixed layer of LSW can be identified by a narrow temperature and salinity minimum close to o2 = 36.940 kg m-3. The increase in salinity within the core occurred as the body of freshwater mixed ever deeper into the warm saline NEADW below (Lazier et al., 2002; Yashayaev 2007b). It is possible that entrainment of warm and salty Irminger Sea waters also added salt to LSW1987-1994. The warming due to mixing was more than compensated by heat loss to the atmosphere, but the additional salt mined by the convection prevailed in its effect on the LSW salinity over the source of freshwater from the inshore waters and the sea surface. A reversal of the trend to higher salinities occurred in 1994 when the LSW1987-1994 core became significantly fresher (by 0.01). We suggest the following explanation for the abrupt freshening. Despite further cooling of the whole mixed layer caused by winter convection in 1994, the mixed layer did not extend noticeably deeper in the spring of 1994 than the mixed layer of the previous year (Fig. 24.8). The convection of 1994 therefore did not bring up much new saline NEADW from below. On the other hand, an increased accumulation of less saline water in the upper 300 m layer between 1993 and 1994 is evident in Fig. 24.8. Thus, the freshening effect from convective entrainment of the less-saline upper-layer waters dominated over the salting effect of NEADW entrained from below. The amount of the warmer and saltier Irminger Sea waters that was brought into the Labrador Sea between 1993 and 1994 was also insufficient to compensate the freshening arriving from the less-saline entrainment. 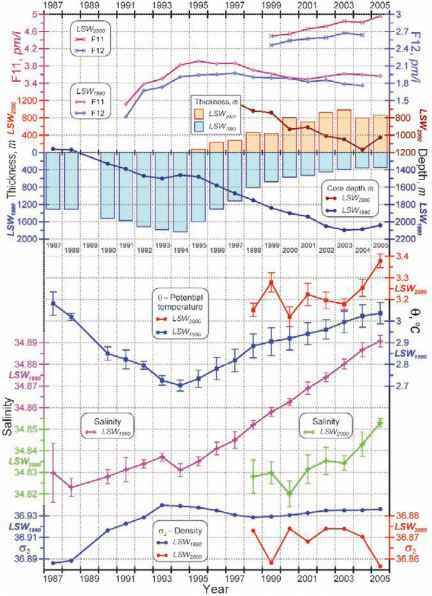 The result was the 1994 minimum in the LSW1987-1994 salinity series (Fig. 24.7). This event was the second minimum in the deep LSW salinity record since the mid-1980s. The first minimum was observed in the late 1980s (Fig. 24.5). This indication of two consecutive LSW1987-1994 salinity minima in the Labrador Sea will help to interpret the LSW changes in other regions. LSW1987-1994 showed two periods of increasing salinity, the late 1980s to 1993 and 1994 to the present. These similar trends, however, are different by nature. First, the sustained increase in the LSW1987-1994 salinities until 1993 was maintained by entrainment of saltier NEADW into fresher LSW every time that convection deepened. It is also possible that convective entrainment of the warm and salty waters from the Irminger Sea had added extra salt to LSW1987-1994. Second, after the cessation of convective renewal of LSW1987-1994, isopycnal mixing with saltier intermediate waters from outside the Labrador Sea became the main agent for the salinification of this LSW class. This change in the dominant source of salt altered the rates of salinity increase (Fig. 24.7). Post-1994 changes are discussed in Section 24.6.2. The history of the LSW1987_1994 temperature changes is somewhat simpler than that of salinity. The cooling of LSW1987_1994 that started in the mid- or late 1980s continued uninterrupted to form the all-time-coldest state observed in 1994 (Figs. 24.7-24.9), after which the LSW1987-1994 temperature began to increase, resulting in a single temperature minimum. The matching tendencies in the temperature and salinity contributions between 1988 and 1993 (Fig. 24.7) explain why LSW1987-1994 became notably denser in each year during this period (Figs. 24.6a, 24.7 and 24.9), which was also accompanied by exceptionally high buoyancy losses in the top 2,000 m.
The described progressive development of LSW1987-1994 can be recapped by the 8-S-time trajectory shown with the light-colored arrow-headed line behind the 1987-1994 annual 0-S curves constructed for the Labrador Sea (Fig. 24.9, upper left panel, 'LSW1994' indicates the coldest point in the history of the LSW1987-1994). This trajectory indicates that the density increase observed during this LSW development was mostly due to the cooling caused by excessive high heat losses during the severe winters of the early 1990s, associated with the high-NAO phase and high heat losses from the sea surface to the atmosphere (Fig. 24.4). The progressive developments of LSW1987-1994 observed in the Irminger (Figs. 24.8 and 24.9, middle left panel) and Iceland (Fig. 24.9, lower left panel) basins had much in common with the reported build-up and development of the same water in its source or formation region in the Labrador Sea. Both in the Labrador and in the other two basins this remarkable water mass experienced substantial cooling and freshening, accompanied by density, volume and depth increases. Even though the LSW1987-1994 property changes seen in the three basins were similar in their appearance (note the increase in the LSW1987-1994 layer thickness in the Irminger Sea), there was one principal difference - the lSW1987-1994 class reached its all-time densest/ coldest state in 1993/1994 in the Labrador Sea, in 1995/1996 in the Irminger Sea and in 1999 in the Iceland Basin Figs. 24.9 and 24.13. This fact is highly important for understanding the overall spreading process of this water mass, as discussed later in this chapter.